Yard sale is in full swing here in St Tammany. Due to some family emergencies, however, time was limited so I selected what I considered was going to be the best ... the annual yardsale at the local Hosanna Church. 4 wood cigar boxes, which were being used as crayon boxes. 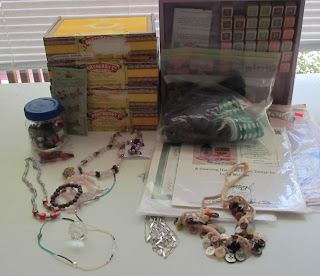 I love boxes and these are the perfect size for mixed media fun. I know I already have a small stack of boxes awaiting creation in the garage, but these were just 50 cents each and they were calling me. buttons -- a button necklace, a jar of buttons, and a card of dog and bone buttons. A couple bracelets and necklaces to add to the bead and chain collections. I know I'll use these someday. Let me repeat that ... I know I'll use these someday ... I know I'll use these someday ... I sure hope I use these somedays as I've almost a ton of this stuff. A bag of braid and some ribbons. Box of Alphabet (and other) rubber stamps. Two cross stitch patterns which are Cajun related. These will go to the cross stitch section of my shop. I'm going to start setting aside (like ya right, I'm that busy) an hour or two each to start playing with my stuff again.